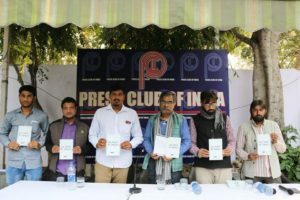 CERT releases “Yuva Vicharon Ki Vishkaran” book at Press Club of India on 01/12/2017. 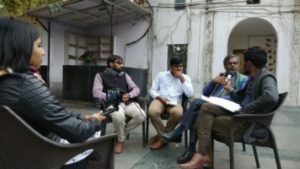 If we ponder over changes taken shape in curriculum design and syllabus contents during last few years under different Central and Western states, therein appears a political interference – manifest and prepossessed, such that in this context too, deliberation and reflection becomes essential: what is the cause of political interest in syllabus textbooks? What relationship do school books have with core objectives of education? Whether the textbooks are proving helpful to students in guiding them towards principle motives of education? Searching answers to these and some other similar questions Centre for Educational Research and Training (CERT) analysed the New Textbooks of four states (Rajasthan, Gujarat, Karnataka and Madhya Pradesh) claiming to be based on National Curriculum Framework 2005. But while the Centre has tried to understand the presentation and observation of issues in this regard, such claim about the textbooks testified to be entirely baseless and lacking no standing. Ancient Indian history is portrayed to begin with Vedic era carrying the ‘description’ of Aryan society. The book stratifies the social sphere in four categories: Brahmin, Kshatriya, Vaish and Shudra. It is mentioned that those engaged in ‘low level’ or baser work were called Shudra! Handwriting of Harshavardhana is given, which is in Sanskrit. His ‘routine life’ finds a mention too, with themes given as i) Administrative activities ii) Social Welfare activities, and iii) Religious activities. He is said to have erected many temples and ‘Maths’, and restricted killing of animals. At the end, the chapter describes social life alleging that people followed ‘Hindutva’! The book describes that Peepal Tree was ‘important’ for Harappa civilization, and that it is revered today. Such description is against National Curriculum Framework’s (2005) directive prohibiting sectarianism and promotion or publicity of religion. Arrival of Muslims is called foreign invasion, although the earliest of Muslims to arrive in India were traders who landed in the Malabar region (and who introduced the Indian invention of mathematical ‘Zero’ with the world). A Nagarjuna ‘picture’ finds place along with JC Bose, Bhagini Nivedita and Gandhi’s photographs in the chapter on ‘Historical and Cultural Pride’. In this same chapter is described tribal leader Birsa Munda. The claim however, is that all these gentlemen studied Vedas, Ramayana, Mahabharata and Geeta under Nivedita who was a student of Vivekananda! Charak, Sushrut, Rani Durgavati, ‘Vir’ Savarkar and Patel find a mention. Nehru is missing from these books! 1) Sri. Raghavendraswami of Malladihalli and his Math (p.14). 2) Sri vyasaraya and his Math (p.23). 3) Sri.Chennamalla Swami, Nidumamidi Math, Guluru (p.20). 4) Sri.Shivkumara Swami and Siddaganga Math, Tumkur (pp. 21 and 34).